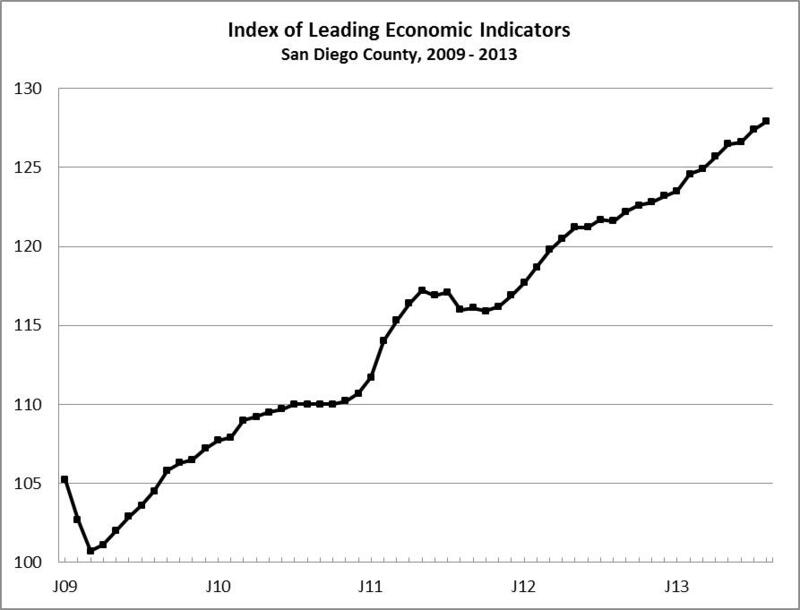 September 27, 2013 -- The USD Burnham-Moores Center for Real Estate’s Index of Leading Economic Indicators for San Diego County rose 0.4 percent in August. The advance was led by big gains in consumer confidence and the outlook for the national economy. There was also a small gain in local stock prices. These gains outweighed small declines in building permits, initial claims for unemployment insurance, and help wanted advertising to push the USD Index to its 12th straight gain and 21st in 22 months. August’s gain means that the forecast remains for positive growth in the local economy in the year ahead. However, there are some areas of concern. The breadth of the advance left something to be desired. Only three of the six components were up, the worst performance on that front since the Index declined last August. Both labor market variables were down (see below) for the first time in nearly three years. As a result, job growth has slowed considerably. As was mentioned in last month’s report, year-over-year job growth comparisons have weakened since the beginning of the year, with the gain in August being only 14,800. One big potential problem at this time is the political turmoil over shutting down the government and/or extending the debt ceiling. Failure to do the latter in particular could trigger a financial crisis that would threaten to derail a fragile recovery, and the local economy is unlikely to be able to avoid the fallout from that. Highlights: Residential units authorized by building permits remain extremely volatile. After being up sharply in July, residential units authorized fell for the first time since January. This was even though the data are smoothed with a moving average to reduce month-to-month fluctuations. . . For the first time since December 2010, both labor market variables were negative. Job losses, as measured by initial claims for unemployment insurance, were up for the fourth consecutive month. On the other side of the labor market, help wanted advertising turned down after having rising for nine months in a row. The local unemployment rate still decreased to 7.4 percent in August from 7.8 percent in July, but as was mentioned above, job growth has slowed considerably since the beginning of the year. Consumer confidence continues to rise, with the measure now up four months in a row and up sharply three consecutive months. This is significant because consumption has been about 70 percent of economic activity. Local stock prices were up modestly in July and reached their highest level since December 2007. Local prices are still down 27 percent from their all-time high set in March 2000 at the height of the dot com bubble. The national Index of Leading Economic Indicators recorded its second strongest gain in a row and has not fallen in five months. Despite that, there is some concern that the national economy will slow in the second half of 2013. Gross Domestic Product growth for the second quarter ended up solid if not spectacular, with the third estimate showing an annualized 2.5 percent growth rate for GDP for the quarter. But some economists are expecting a slower third quarter as job growth continues to be weak. There is already concern that the Christmas buying season will be slower than initially expected. August’s increase puts the USD Index of Leading Economic Indicators for San Diego County at 127.9, up from July’s revised value of 127.4. A revision in the national Index of Leading Economic Indicators for July caused the previously reported value of 127.5 for the month to be revised downward to 127.4 and the change to be revised downward to 0.6 percent from 0.7 percent.